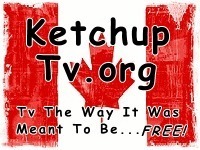 KetchupTv is a Place for Canadians to watch their favorite show. Whether they have cable or not, or may have simply missed their favorite TV Show! Ther are plenty of On-Demand places, But KetchupTv IS the First to start a site like this. Wish to do the States as well, But need backing for this and MUCH More! I Have Always Strived to have my Own Business, Hard to do Without Money. I have MANY Other Ideas both Physical and Virtual.